I’ve heard that some helium canisters are now being diluted with air. I bought my canister on …. will it be ok? In some countries (including the U.S.A.) manufacturers are now saying that they are diluting the helium content of balloon gas. They say that all such items are clearly marked ‘helium/air.’ The same sources say that European balloon gas is unaffected so far. The information varies, and the data for instance from Worthington (a major manufacturers) does not seem always to coincide with that from Balloon Time (major supplier connected to Worthington). Bear in mind these companies update their data sheets every so often and you maybe need to use an Internet Wayback-type search engine to access earlier data sheets. Most canisters labelled ‘helium’ will just contain helium, but there is another link in the chain: the retailer. Although it is against guidelines to refill canisters in this way, anyone wanting to save money could refill a tank with a helium/air mix and re-sell it. If it contains 60% helium, it will still float balloons and so it ‘fit for (that) purpose.’ Generally speaking, canisters purchased some time ago will be fine. The only way to test if the contents are exactly as described is to use a gas testing meter for purity and a pressure meter to calculate the volume. Most retailers are honest and would not go to such trouble; but we have received rare reports of isolated cases that we were able to verify with a fairly high degree of certainty. These are exceedingly tiny in number, but demonstrate that it can happen. For this reason we investigated industrial gases, which are far less subject to contamination and regulated far more stringently. I just need a quick answer on . . . Some questions have answers but are improper due to legal or ethical guidelines in certain circumstances. 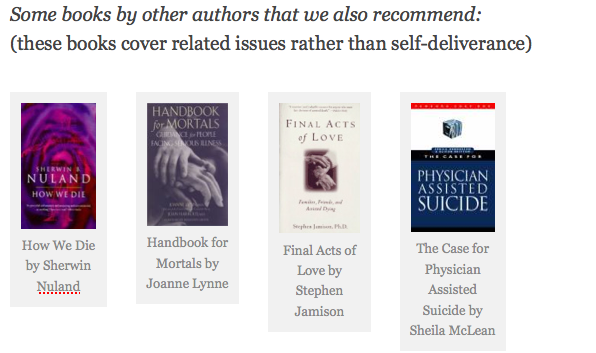 Is ExitEuthanasia Blog just about selling books? If you’re just here to help people, couldn’t you just provide the information as a free e-book? The Blog is primarily for members of Exit, but is of interest and open to the public for its analysis of some issues. (If you are a member, we at least feel you have a serious long-term interest and are a responsible adult.) The Blog is free to subscribe. It makes it clear that it does not provide “how to” information on killing yourself. Graphic and potentially dangerous information is reserved for our books, our occasional workshops and our members’ magazine. Serious scientific research is linked to a serious sense of responsibility. We don’t set the price of the books on Amazon, or the cost of printing, but bear in mind that a scientific book of over 800 pages isn’t produced out of thin air. We don’t receive any government or other research funding. If you consider comparable volumes of that size and that level of original, verified research, you’ll probably be shocked to see that they cost hundreds of pounds. Exit runs at a loss and relies on legacies. Sometimes Amazon offers discounts occasionally. Alternatively you can find smaller volumes on the subject on sale by popular authors such as Derek Humphry’s Final Exit. These are small, almost pocket-sized books which anyone can afford. They are not connected with Exit. There are also expensive books that are not large volumes and not particularly detailed, but we don’t comment extensively on work by other authors unless they ask us. The law is quite clear on helping people directly. This is not something we do. Bear in mind also that we don’t know you personally and would not be in a position to verify your medical details if we did. We recommend that all responsible adults take stock of all the different likely scenarios for dying, letting nature take its course, palliative care, assisted suicide and self-euthanasia. Knowledge is foresight is strength to face the future. Such people make up the majority of our members. Perhaps one day there will be a walk-in clinic where anyone can discuss such matters openly and receive accurate and unbiased information; but as the law stands, if we helped people directly in that way we would also risk being shut down and not able to help anyone. Extensive details, analysis and explanation of the law generally and with particular emphasis on UK law is contained in all our volumes. The most complete and up-to-date edition, that includes the most thorough information worldwide on methods of self-deliverance, is Five Last Act – The Exit Path 2015. We also recommend that all other options are thoroughly investigated before taking the final step of self-euthanasia in the face of unbearable and unrelievable suffering, whether mental or physical. Most end-of-life suffering can be relieved. Knowledge of self-euthanasia gives you a safeguard for the small percentage that isn’t. Not all questions can be answered, or all problems solved. We do our best for those that can.